Nitro Compounds provides information pertinent to the formation, mechanism, synthesis, and structure of nitro compounds. This book discusses the behavioral uniqueness of the nitro group in electric field. Organized into 50 chapters, this book begins with an overview of the amphoterism of HNO3 and its role in the reactions of HNO3 with organic substances. This text then examines the secondary nitroheptane obtained byvapor-phase nitration of n-heptane with nitrogen dioxide. Other chapters consider the explosion hazard of gaseous mixtures in exothermic reactions of oxidation and nitration. This book discusses as well the method used for the investigation of nitration of phenosulphonic acids. The final chapter deals with the relationship between the structure of nitrofuranoic compounds and the fungicidal, bactericidal, and herbicidal activity. This book is a valuable resource for chemists and organic chemists. 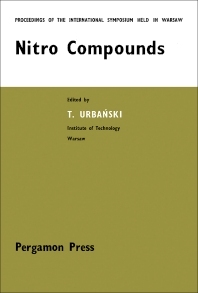 Chemical researchers who are interested in the mechanism and synthesis of nitro compounds will also find this book useful.